Echinolampas sternopetala, copyright Koghisberg's Collections. 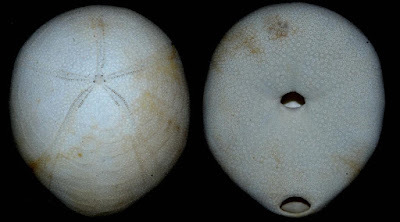 The Echinolampadidae are a group of irregular echinoids known from the Cenomanian epoch of the Cretaceous to the present (Kier 1966). Characters (from Kier 1966): Medium-sized to large, usually highly inflated; apical system tetrabasal or monobasal; petals long, open, usually with unequal poriferous zones, single pores in ambulacral plates beyond petals; periproct marginal to inframarginal, transverse or longitudinal; bourrelets well developed; phyllodes widened, with few or many pores; narrow, naked, granular zone in interambulacrum 5; buccal pores present.